The people of South Sudan have maintained their resilience and are ready to restart their lives despite fighting that has killed thousands and displaced more than 1.7 million people. Catholic Relief Services is there helping people like Kuei Bior, 69, who ran for her life when her village was attacked. She found a hiding place on the banks of the Nile River—where she stayed for more than 3 months. When she returned home, her seeds and farming tools were gone. 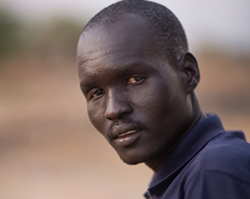 "When the fighting broke out in Bor, I fled to this side near the river. We camped inside the swamps, squatting with some parts of our bodies submerged in the cold water until fighting ended in January," says Kuei. "We came back in March, but we did not get anything in our houses, including seeds. Everything was looted." Like so many others who lost everything in the conflict, Kuei is determined to restart her life—and build a better and stronger South Sudan—with CRS' support. CRS has distributed more than 30,000 pounds of seeds, as well as tools, to more than 2,400 families in Uror County through our Jonglei Food Security Project, which is funded by the U.S. Agency for International Development's Food for Peace program. Kuei received sorghum, maize and groundnut seeds, which she planted on land she inherited from her sister-in-law, who was killed during the December 2013 attack on their village. "Look at my farm: The crops are healthy now because it has just rained," she says. "This support gives us hope to start a new life again in our villages. I hope by August I will enjoy my produce." Ayen Deng, a widow and mother of four, also benefited from the seeds. "We like groundnut very much, especially our children, [who] eat the paste almost the whole day. For those of us who have no cows to get milk, we simply use the paste to wean and raise our children," she says. "Both maize and groundnut can be planted twice a year. In case the first round is not successful due to drought or flood, the second can yield a good harvest." Most people in Jonglei State, especially in rural areas, depend largely on locally available produce to supplement their children's diets. Money is scarce, and fresh fish and meat are rarely served, so local small-scale farmers rely on vegetable crops. They grow okra, kale, eggplant, spinach, tomatoes, onions and other crops. Akok Majer, a mother of six, managed a farm and was able to sell surplus produce to pay for her children's education before the fighting. She says her children enjoyed a well-balanced diet until the conflict started. "We used to eat vegetables at home and sell the surplus. I used the cash to pay school fees and [for] medication for my children. But now it is no more," she says. "I need it back again."